If you have been waiting for a post that shows you how to be ‘more man’, this is it. In 2006, as a young fella, I decided to travel to the other side of the world for my first working holiday. I was GREEN! I knew lots of academic stuff having been through school and university but I didn't know a lot about other cultures or foods and for that matter, anything outside of Australian traditions and foods. When I landed in London, one of the most diverse cities in the world, I met loads of South African people. They're a rare breed when you first meet them! But as I got to understand their somewhat arrogant style (total generalisation), I found them to be amongst the most loving people I've met. I became particularly close to two gentlemen that sat around chewing this dried meat all day while watching the footy. It looked pretty horrible but they loved it and suggested I get amongst. So that I did! With a chopping board on my lap and a carving knife in hand, we must have sawed through 70kg of biltong that first afternoon - I couldn't get enough! The word biltong is from the Dutch bil ("rump") and tong ("strip" or "tongue"). Often confused with jerky, biltong can be produced from many different meats including beef, chicken, fish and all types of game. It is a type of dried, cured meat that originated from South Africa, Namibia and Zimbabwe but is now commercially available right across the world. The major differences between jerky and biltong come down to the preparation technique used. When producing biltong, we use vinegar, salt and spices during the drying and curing process to impart texture and flavour. Jerky in contrast uses salt as the exclusive ingredient and as such, generally the taste is not as impressive. The slow drying time of biltong (3-10 days, depending how dry you like it) means that it is usually cut into thick strips where as jerky tends to be very thin. When someone comes to me asking about a weight loss program, one of the most common statements I hear is "I eat really healthily and I am not sure where I am going wrong!" So when I inspect their regular eating pattern, they often correct. Their three main meals (breakfast, lunch and dinner) are not too bad but it's what is happening in between that is undoing the goodness. The snacks and drinks that a a bloke has 'on the run' are often the problem area and so I'd look to substitute out the chips and chocolate bars for healthier options. It is low fat - compared to cured meats or processed snacks, commercially available biltong is usually made from lean cuts of meat. Fatty cuts can tend to spoil quicker and so they are avoided. This is great because a lower fat content means a lesser calorie intake. And when it comes to meat, reducing overall fat means that by association, we are reducing the intake of saturated fat that would otherwise increase our risk of heart disease. It is high protein - due to the drying process, it takes about 200g of raw meat to make 100g of biltong. The loss of water makes the end product a very concentrated protein source because you're effectively getting the same amount of protein as in a 200g steak - around 55-60g. 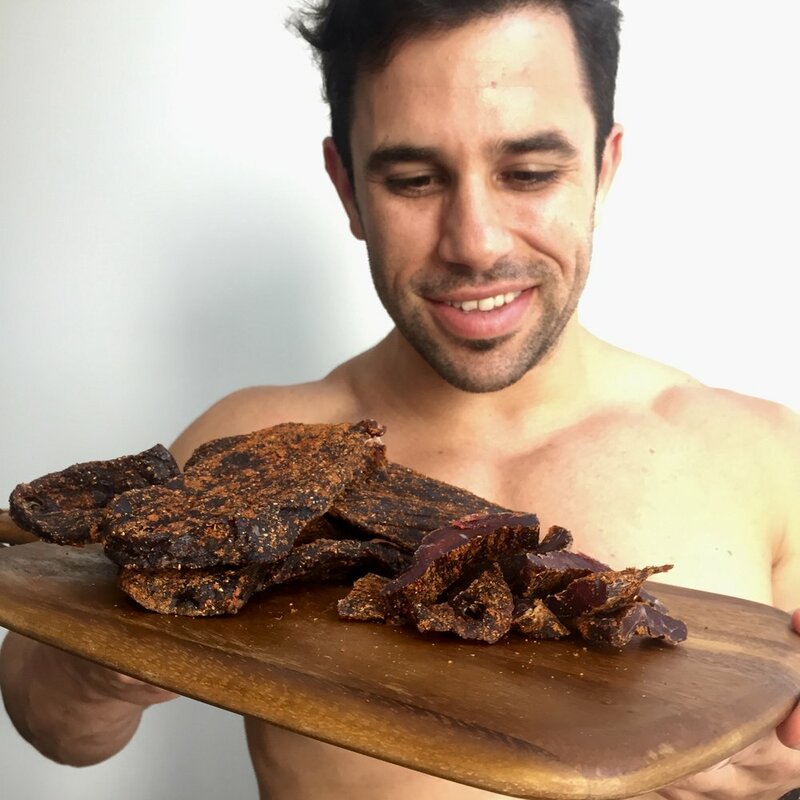 Given an average man needs around 1-1.5g of protein per body kilogram of weight, a 90kg lad would be getting around half of his daily protein requirement through one 100g serving of biltong. This is great for both muscle preservation and your general bodily function. It is rich in vitamins and minerals - biltong is packed with micronutrients that are essential to proper functioning and due to the non-destructive preparation techniques, those nutrients are preserved. Biltong is rich in Vitamin B12, iron, zinc, taurine, carnitine, creatine and a host of other important factors. Yep, that's what I said! Making your own biltong is surprisingly easy but why would you want to do this? The average 100g pack of biltong in Australian costs around $10 making it a fairly pricey snack. But the price is not in an exorbitant margin, more the fact that meat is not cheap. And so to make biltong at home, you need to invest in a biltong maker and then the cost of the ingredients involved. SO WHY DID I THEN GO AND BUY MYSELF A BILTONG BOX? Well there's something very manly and enjoyable about the prospect of making one's own biltong and perfecting the recipe that outweighs any financials. Perhaps it's the same as growing your own herbs or catching your own fish - you feel the value that has gone into the process. Or maybe it's the tease of watching your biltong hang and dry as you await the day you can devour it. Needless to say, I'm hooked. I sourced my biltong box for $100 from www.biltongbru.com.au - an Aussie company that imports the well-regarded Mellerware Biltong King. 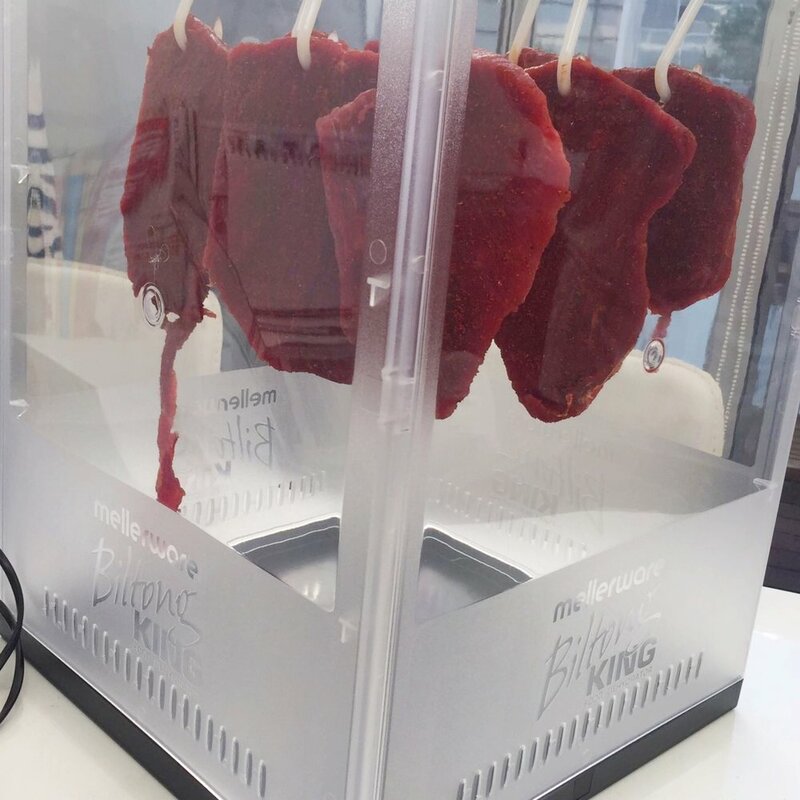 It's attractive, convenient and does the job on about 3kg of raw meat at a time. I love them so much that I contacted them and asked for a special discount code for my subscribers and they obliged - if you want your own box, make sure to enter 'JSBBRU17' as the voucher code at checkout! Well I don't actually know if that exists as it is so dependant on personal preference on taste and texture. Here's the protocol I've been following along with some pics of the process involved. 1 tablespoon paprika or chilli flakes. In a seperate bowl, mix the remaining ingredients and then rub the seasoning into the meat. Lay the meat slices onto a tupperware container and cover with lid. Leave to marinate in the fridge for 12-24 hours. Remove and hang meat from your hooks inside the biltong box. The drying process takes anywhere from 1-10 days depending on personal preference for level of dryness. Cut into thin slices and store in an airtight container. The end product can be flavoured in any way you wish such as adding chilli or peri peri. Regardless, you will find yourself scaling the ladder of social appreciation very quickly, for a man that makes his own biltong is truly valued.